Expanding upon Metrodata's popular embedded network monitor and tester the NetTESTER, the new NT10G05 offers network testing and monitor at speeds up to 10Gbps. Like the rest of Metrodata's NetTESTER network performance assurance probes, NT10G05 provides a cost-effective way of accurately measuring the performance of newly installed network circuits up to 10Gbps, comprising either 'Layer-2' Switched Ethernet or 'Layer-'3 IP Routed infrastructure. Thereafter, ongoing 'in-service' performance up to 10Gbps can be readily monitored and alarms raised in the event that performance falls below pre-defined levels, most likely related to the 'service level agreement' (SLA) criteria established with the Service Provider in relation to Throughput, Latency, Jitter, Packet Loss and overall 'availability' for a given link. 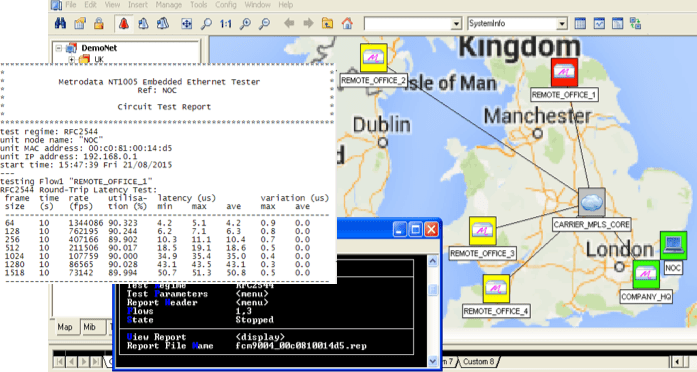 NetTESTER uses industry standard network performance test profiles, including RFC2544 and Y.1564, by which test traffic generated and transmitted from one or more points in the the network is reflected back at line rate from other locations and used to compile detailed reports which can then be viewed on-line from one or more Network Management systems, or alternatively transmitted directly to the Management centre for ready compilation into customer reference documentation. Once circuits are in active service, NetTESTER uses the minimally invasive Two-Way Active Measurement Protocol (TWAMP) to monitor the integrity of links throughout the Corporate network, maintaining on-board comprehensive records for period of up to one month for subsequent interrogation, or generating alarms as necessary. Alternatively, critical performance data can be periodically captured from NetTESTER by (typically SNMP-based) Network Management systems for incorporation to graphs, tables or other report formats. Metrodata Ltd. offers cost-effective NetTESTER probes for network links of up to 10Gbps. In use with both Telecoms Carriers and Corporate Enterprises for whom Network connectivity is a critical resource.